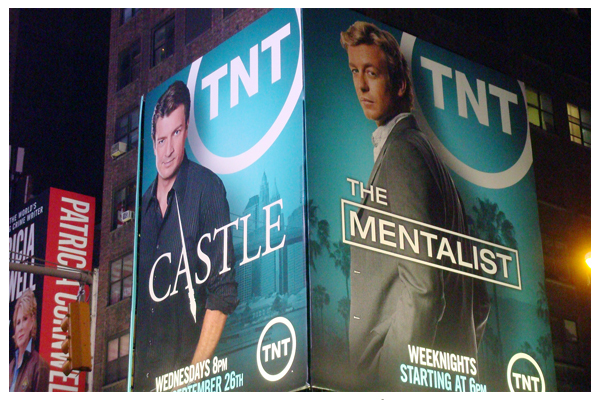 When I saw these billboards just off Times Square I felt some significance in the fact that these were for two my favorite TV shows at the moment, one of which takes place in California where I live and the second one – in New York where I spent the last week. I love-love-love New York! Once I unpack and spend some quality time with Rusty I’ll write up some of the perfume-related impressions from my wonderful vacation. How have you been? Do you watch any TV shows? If yes, what are your favorite ones? This entry was posted in A Postcard from Undina, Random Stuff and tagged Castle TV show, New York, Paradise Ridge, Sonoma, The Mentalist TV show. Bookmark the permalink. Naah, Hardly watch TV at all. Jin does though and has Korean TV or American comedy cartoons running night and day. Family Guy taught him to speak English! TV series help language learning process – that’s for sure! Oh this is too exciting. Can’t wait for your write-up. I’ve been to New York once but I’d love to go back as a perfume nut. I’ll have to look out for those two TV shows on the billboards, I watch far too much but it’s a great distraction sometimes. I particularly love Nurse Jackie, Mad Men and Friday Night Lights (thanks to Natalie for the last one). I can full-hartedly recommend both: they aren’t too serious and very interntaining. We plan to start watching Mad Men: we don’t have the chanel that shows it, so we plan to watch online. Mr. Poodle usually has the remote control so more often than not we are watching something sports related. I don’t care though. Mostly I don’t mind sports and I’m not a huge tv fan. I do like Downton Abbey. If he’s not home I don’t even turn the tv on usually. I have the news on in the morning but only to check the forecast. The only time there is any sport on our TV – during Olympic Games (and it’s me who’s interested in it). I watched the first season of Dowton Abbey online, liked it and now I’m wating for the next season to appear somewhere for me to watch. I think PBS will be airing season 2 soon to lead into season 3. Keep your eye on the listings. Or you could come to my house and watch it on DVD. I’ll keep an eye on PBS’ listing – thank you. I’m heading to NY right after Thanksgiving, so please pass on your best perfume experiences so I can plan my trip. As for TV, I guess I am from the generation of TV love. Our TV is on all of the time. Now, that doesn’t mean we’re watching it, but there is something about the white noise that I have just gotten used to. I also love TV. I have it (or my iPad) as a phone for doing something that doesn’t require concentration. I’ve been watching Elementary – it’s so good, I think the best new show on! I’ve watched Gary’s Anatomy since the beginning. I’ve also been watching re-runs of Mad Men, Nip/Tuck (yikes! ), and The United States of Tara. All very good, though Nip/Tuck gets pretty intense! nina,, I’m glad to hear Elementary is good, as it’s starting in the UK soon and I’m looking forward to it. The BBC’s own recent re-working, Sherlock, is probably my favourite TV show of all and I highly recommend it. I also started watching Elementary and I like it so far. I tried watching Nip/Tuck when it aired first but couldn’t: too much drama and unnecessary gore details for my taste. Yay for NYC! We all seem to love Big Bang Theory, even the cat. Second favorite probably The X Factor which the cat sleeps through, and the tween adores. So glad you had a fun time “rockin’ around in NYC” (to steal a line from a favorite Marshall Crenshaw tune). Will look forward to your write-up. I hardly ever watch television most of the year, but may start tuning in again in winter. I’m addicted to Netflix, though, so if I hear that people love a particular TV series, I’ll often watch it on my computer via Netflix … usually years behind everybody else. :D Guess you could say I’m more of a film lover than a TV lover. I also use Netflix. Now I’m watching Buffy (for the first time). I’ve never been to New York. It’s so far away from where I live. I think the flight would take around 24 hours for me to get there. Well, I’m not a big tv series lovers but I watch few Polish series productions from time to time, nothing special. Rusty has occupied my lap and interrupts laying there and purring only to get some food. 9 hours? That’s unexpected. I thought it would be much longer. I would need 6 more hours to get to Warsaw from my hometown. -Revolution (I have been trying this one out but not sure I am going to stick with it). I used to watch Castle, and then life got in the way. I actually may try to catch up with what I’ve missed at some point. It’s a really good show. I haven’t seen a single show from your list! I watch a lot of TV – Castle, Grimm, Once Upon a Time, plus lots of sitcoms as they are much better than they used to be – Modern Family, Parks & Rec, Suburgatory. And the only reality/competition show I watch is So You Think you Can Dance. And of course, Jeopardy and Antiques Roadshow. And when good cable shows come to Netflix Instant, I’ll watch them. We are currently in the middle of Breaking Bad. Mad Men, Downton Abbey and Dexter are on the list to watch next. Gah! That sounds like so much! Time to start reading more. First three – check, check and check! I haven’t checked for a couple of months but before that Netflix had the first two seasons of Dexter available for streaming and then I didn’t see even them. Or are you planning on watching the current season on TV? I love Dexter but haven’t seen the last one or two? seasons? I watch TV, but mine is “delayed” for lack of a better word. We have no TV signal in our house, so we watch shows once the season comes out on DVD, or on Netflix. No waiting, no commercials, and for some strange reason I much prefer having the subtitles on (the Wild Things grumble that I am going deaf). Favorite shows include Supernatural, Castle, Big Bang Theory, Walking Dead, as well as revisiting my faves like BtVS. I’ve heard good things about Grimm, Downtown Abbey and Vampire Diaries, and will likely check them out at some point. We watch most shows in recording so no commercials as well (unless I stop to watch something that attacted my attention during skipping a commercial break). My vSO likes Walking Dead so I keep him a company but it became too much for me by the end of the season. I was a big Castle fan but am not sure I like this new season. Though they are doing the relationship with humor and grace, that’s for sure! In general, I prefer X-Files’ type of relationships between main characters: almost but never there. But we’ll see how it goes in this season. Oh, the Mentalist is one of my favorite shows. I absolutely adore Simon Baker and I think he is one of the best actors around, no matter what he does. I don’t understand why he hasn’t received an Emmy award. He deserves recognition for his marvelous acting abilities. I love The Voice too, and I always try to catch Modern Family and The Middle. I used to love Modern Family but the first episode from this season was a little mean spirited so I’m hesitant to watch it anymore. I want comedy to be fun not mean – I watch enough negativity in other shows! I’ll check out a couple of those you’ve mentioned. I liked the first episode of the first season of British Sherlock but the rest I liked less and less. Two episodes of Elementary, so far, were entertaining. I plan to keep watching. Hurrah for New York! I don’t watch a ton of TV, but I always watch The Daily Show and Project Runway. Sometimes The Voice. And I have started watching Grey’s Anatomy again because there is a doctor on now who reminds me of Mr. APB, and so that is my biggest guilty pleasure show. I do not watch The Daily Show regularly but whenever I stumble upon it I enjoy it a lot. I’m very much enjoying your blog and especially love your perfume portrait page as well as your various brilliant graphs that vibrantly track perfume loves. Eager to hear about your New York scent experience, hope you stumbled across Aedes de Venustas on Christopher Street – a hidden or maybe not so hidden gem! oh, also snacked on Misfits UK on hulu tv. prime time? not so much these days. Hi Renee! Nice to see you here. I read all your posts in one sitting and was very touched by how you write about your parents. I decided against visiting Aedes de Venustas because they didn’t have enough brands I wanted to try at this time. But I visited enough other places (I’m almost done with my report). Hi Undina, I am looking forward to reading about your New York experience. I haven’t watched tv in almost 2 years. I do check out Netflix occasionally and I am making my way through the “Weeds” series.